WASHINGTON (AP) — American dairy farmers get more access to the Canadian market. U.S. drug companies can fend off generic competition for a few more years. Automakers are under pressure to build more cars where workers earn decent wages. The North American trade agreement hammered out late Sunday between the United States and Canada, following an earlier U.S.-Mexico deal, shakes up — but likely won't revolutionize — the way businesses operate within the three-country trade bloc. BRUSSELS (AP) — U.S. trade officials say they hope to reach an agreement with the European Union on lifting some technical barriers to trade between the two powers by November. Trade Representative Robert Lighthizer's office said Monday that "we hope for an early harvest in the area of technical barriers to trade," following talks with EU Trade Commissioner Cecilia Malmstrom. But while politicians and businesses welcomed the deal Thursday, the agreement was vague, the negotiations are sure to be contentious, and the United States remains embroiled in major trade disputes with China and other countries. BERLIN (AP) — Political and business leaders in Germany, Europe's biggest economy, on Thursday welcomed a deal to defuse trade tensions between the U.S. and the European Union, but relief was tempered with caution that details must still be firmed up. But the agreement was vague, the coming negotiations with Europe are sure to be contentious and the United States remains embroiled in major trade disputes with China and other trading partners. FRANKFURT, Germany (AP) — European Central Bank head Mario Draghi says that new trade barriers are the main risk to Europe's economy and that it's up to the EU to "lead by example" by supporting economic openness and reforming its institutions. House Speaker Paul Ryan is criticizing Trump administration trade policy after Harley-Davidson cited retaliatory tariffs as why it's shifting some production of motorcycles overseas. The Wisconsin Republican tells reporters Tuesday he doesn't think tariffs "are the right way to go." He didn't mention President Donald Trump by name but says tariffs are "basically taxes." Gov. Scott Walker is not engaging with President Donald Trump as he criticizes Milwaukee-based Harley-Davidson for moving some production overseas. Harley said Monday it came to its decision because of retaliatory tariffs it faces in an escalating trade dispute between the U.S. and the European Union. MILWAUKEE (AP) — Production of Harley-Davidson motorcycles sold in Europe will move from U.S. factories to facilities overseas, the Milwaukee-based company announced Monday, a consequence of the retaliatory tariffs the EU is imposing on American exports in an escalating trade war with the Trump administration. WASHINGTON (AP) — President Donald Trump is lobbing new threats against U.S. trade partners. Trump says Sunday on Twitter that the U.S. is "insisting" that countries remove "artificial" trade barriers and tariffs on U.S. imports to their countries "or be met with more than Reciprocity by the U.S.A." He says "Trade must be fair and no longer a one way street!" A trade association representing a dozen automakers doing business in the United States says President Donald Trump's threat to slap 20 percent tariffs on vehicles imported from Europe is "not the right approach." WASHINGTON (AP) — Insulting the host, alienating allies and threatening to suspend business with other countries: President Donald Trump was in full trade-warrior form for the weekend summit of the Group of Seven wealthy democracies in Canada. 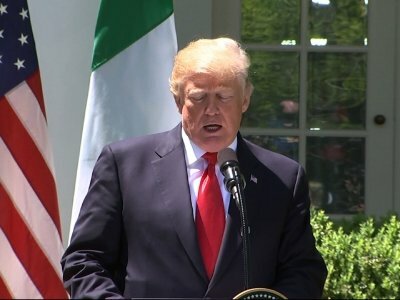 WASHINGTON (AP) — President Donald Trump faced pushback Monday from Republican lawmakers, an influential GOP group and foreign leaders over his tough negotiations that are hitting China, Canada and Mexico with tariffs amid fears of a trade war. But the president defended his actions saying the U.S. would soon be in a stronger position with its top trading partners. President Donald Trump is defending his new trade policies, saying trade practices by other countries are "Not acceptable!" Trump has imposed penalty tariffs on steel and aluminum imports from major U.S. trading partners, including Canada. And he has threatened tariffs on up to $200 billion in Chinese imports, moves that could trigger a global trade war as the targeted nations pledge to retaliate. PARIS (AP) — An international economic watchdog says threatened new trade barriers and rising oil prices could hurt long-awaited global economic growth. The Organization for Economic Cooperation and Development said Wednesday that "the threat of trade restrictions has begun to adversely affect confidence" and tariffs "would negatively influence investment and jobs." WASHINGTON (AP) — President Donald Trump's hard-line views on trade, a staple of his message long before he entered politics, are beginning to collide with the cold realities of global geopolitics. Trade talks on China and the North American Free Trade Agreement have hit stumbling blocks, posing a challenge for a president who vowed to make trade deals more equitable for the United States during his 2016 campaign and who famously tweeted that trade wars are "easy to win." BERLIN (AP) — German Economy minister Peter Altmaier said Tuesday he's hopeful that there can be a worldwide reduction of trade barriers, despite ongoing threats by U.S. President Donald Trump to slap tariffs on steel and aluminum imports from the European Union and other countries. "I have always expressed hope that we can come to a worldwide reduction of trade barriers," Altmaier told reporters in Berlin. "That should also be possible with the United States as part of a fair agreement." President Trump on Sunday predicted a "great future" for both China and the U.S. amid an escalating trade dispute, saying China would take down its trade barriers because it's "the right thing to do." Another flare-up in trade tensions between the U.S. and China sent the stock market sharply lower for the second time this week. The Dow Jones industrial average lost 572 points Friday, having traded down as much as 767. It fell modestly for the week. Is it possible Donald Trump is winning on trade? Last week, Trump apparently delivered two underappreciated victories as a result of his threat of stiff tariffs and renegotiated trade deals. First, Seoul has agreed to reduce long-standing nontariff trade barriers that have reduced American exports to Korea. The president declares the U.S. will impose steep tariffs on steel and aluminum imports, escalating tensions with China and other trading partners. With the seventh round of negotiations between the United States, Canada and Mexico to update the North American Free Trade Agreement quickly approaching, it’s critical to keep in mind how NAFTA helps businesses, workers, farmers and ranchers, like myself, throughout Texas and across the United States each and every day. ALBUQUERQUE, N.M. (AP) — Several U.S. senators are urging federal trade officials to take action to lower tariffs on pecan exports to India in hopes of helping growers in a number of pecan-producing states. The bipartisan group of lawmakers sent a letter recently to U.S. Trade Representative Robert Lighthizer, saying the high tariffs are affecting American farmers and have created a trade barrier not imposed on other tree nut producers. WASHINGTON (AP) — The Trump administration on Thursday announced plans to renegotiate the North American Free Trade Agreement with Mexico and Canada — a move that could shake up business across the continent. LONDON (AP) — The European Union's chief Brexit negotiator reassured Ireland on Thursday that the bloc will fight to ensure there is no return to a hard border with Northern Ireland after the U.K. leaves the EU. But Michel Barnier suggested that keeping the border free of controls could be complicated, noting that "customs controls are part of EU border management. They protect the single market. They protect our food safety and our standards." MANILA, Philippines (AP) — The 10-countries of the Association of Southeast Asian Nations, or ASEAN, could form the world's fourth largest economy by 2030 though work is needed to help small companies and reduce trade barriers, Malaysia's Prime Minister Najib Razak said Friday. Najib told a business forum on the sidelines of a summit of ASEAN leaders meeting in Manila that the combined size of the group's economies will grow to $9.2 trillion by 2050. BADEN-BADEN, Germany (AP) — Top finance officials including new U.S. Treasury Secretary Steven Mnuchin are debating what stance to take on free trade at a meeting that will help set the tone for the global economy. The gathering of finance ministers and central bank heads from the Group of 20 countries has focused on shifting attitudes toward trade, particularly after U.S. President Donald Trump vowed to impose border taxes and rewrite free trade deals he says have shortchanged the U.S.
GREELEY, Colo. (AP) — Weld County, Colorado, is more than 700 miles from the closest Mexican border, but a proposed import tariff on the United States' southern neighbor leaves local agriculture commodities in a state of uncertainty. At the end of January, President Donald Trump suggested a 20 percent tariff on all imports from Mexico to pay for his long-promised wall between the bordering countries. MADISON, Wis. (AP) — Motorcycle maker Harley-Davidson, which President Donald Trump singled out Tuesday when discussing foreign trade barriers, warned earlier this year against responding to such restrictions by imposing higher American tariffs. Trump said in his speech to Congress that executives from Harley-Davidson told him they have trouble selling motorcycles outside of the United States because of high taxes. A spokeswoman for motorcycle maker Harley-Davidson says the company is open to trade policies that address barriers to international growth. Pat Sweeney was responding to a question about a letter a lobbyist for Harley sent to the Office of the United States Trade Representative earlier this year.